It’s been many years since I learned the ins and outs of percentages, ratios and parts. I get plenty of practice playing with them though since almost every day is a soap day around here (lucky me!). It is one of the more common questions that our stupendous team gets whenever soapers are trying to calculate parts (whozit? whatzit?! ), resize batches or try to figure out if they have too much (or too little) coconut oil in their recipe. One of the most common places you see percentages and parts is in product usage rates. For example, let’s say you wanted to add some extra lip-loving power to a lip balm by adding Green Tea Extract. The usage rate for this extract is no more than 3%. If you wanted to add this extract to 4 oz. of Lip Balm Base, how would you go about it? The answer comes through some nifty multiplication. You would simply multiply the percentage (3%) times the total amount of base (4 oz.). The resulting equation would look like this: .03 x 4 = .12. Since your base was measured in ounces, the resulting answer is also in ounces. It’s such a tiny amount that you may find it easier to convert it to milliliters and then use a dropper to add in the extract. Here is a good conversion calculator. According to the calculator, .12 oz. is equivalent to 3.5 milliliters. The great thing is this formula applies to any and all products with a given usage rate. Preservatives, extracts, waxes and other additives general list usage rates that way. In this photo, the whole circular soap is comprised of 1 part yellow soap, 1 part fuchsia soap, 1 part orange soap and 1 part green soap. Another way to say that is that each color represents 1/4, or 25%, of the circle. 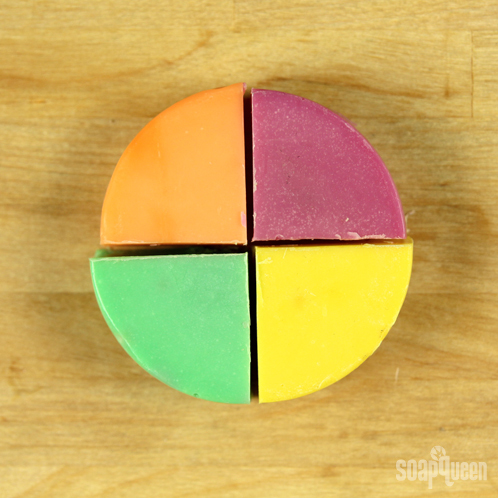 Here the soap circle is comprised of 2 parts green soap, 1 part fuchsia soap and 1 part yellow soap. 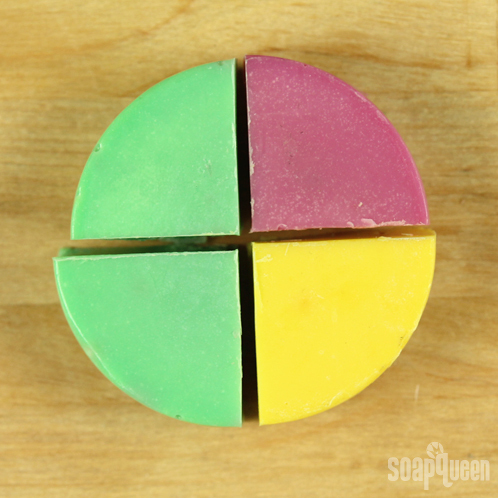 Another way to say this is the green soap represents 50% ( or 1/2) of the circle while the fuchsia and yellow soap each represent 25% (or 1/4) of the soap. Finally, the circle is now comprised of 3 parts green soap and 1 part fuchsia soap. 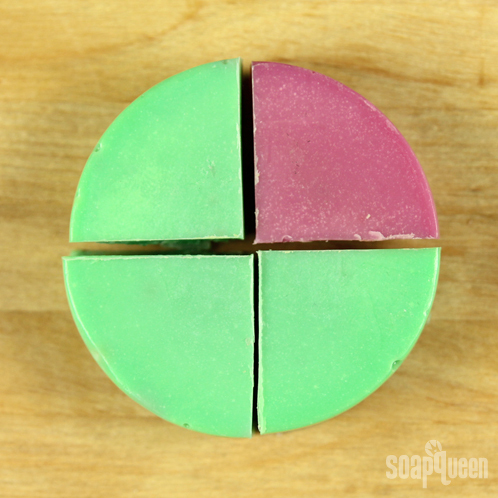 This also means the green soap is 75% of the circle (or 3/4) and the fuchsia soap is 25% (or 1/4). As you can see, parts can easily convert into percentages or fractions. But what if the numbers aren’t so clean? You know the total number of parts involved is 5 (2 parts plus 3 parts). To start, divide the total amount of essential oil by 5. That works out to equal .84 (4.2/5 = .84). That number is the multiplier that will help you translate the “parts” into actual numbers. In this case, 2 parts Black Pepper x .84 = about 1.7 oz. Likewise, 3 parts Litsea x .84 = 2.5 oz. To double check yourself, add those amounts and see if they equal the total amount of essential oil you calculated earlier. In this case, they do! 1.7 + 2.5 = 4.2, which means your calculations check out. This is so the recipe can adapt to any size mold. It doesn’t matter if you’re making it in a 10″ Silicone Loaf Mold or the 36-Bar Birchwood Mold, the ratio of oils will be the same no matter the size of the batch. In this case, let’s go with the 10″ Silicone Loaf mold. According to the website, it holds 50 ounces of soap. This is where the Lye Calculator comes in handy. Simply input the percentage amount into the calculator, select the “percentage” button on the calculator, and then enter the oil weight. 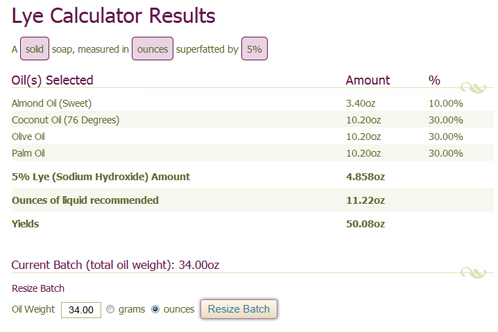 For a 50 ounce recipe, your oils will weigh about 34 oz. 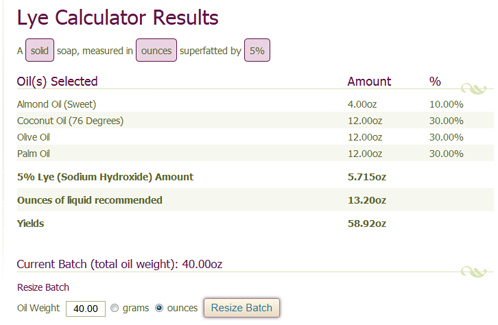 Select a superfat of 5%, and the calculator gives you the following results: 3.4 oz Sweet Almond Oil, and 10.2 oz. of Coconut, Olive and Palm oils. Note about superfat: Typically Soap Queen recipes are superfatted at 5%, but your superfat all depends on personal preference. You can read more about superfat here. A quick note: Oil weight is not the same as yield. Often times, you’ll know the yield but not the oil weight. I know water makes 35% of my soap batch – but if you don’t want to do the math- the lye caluculator makes it easy In the event you didn’t know the oil weight for a 50 oz. batch of soap was 34 oz., you could have simply entered the yield in the oil weight box. 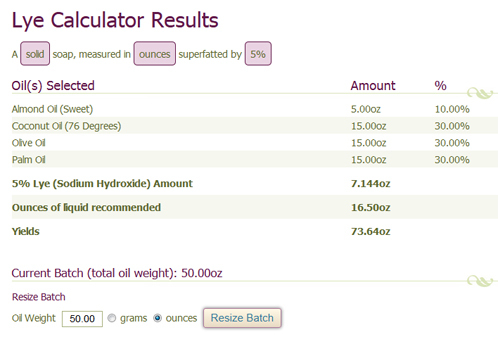 Then, you could use the Resize Batch option on the next page to keep resizing the oil weight until the yield equaled 50 oz. It’s the non-math way to figure this out. The Lye Calculator result if you enter 50 oz. as the oil weight. Notice the yield is about 74 oz., which is way too big. After using the Resize Batch button with an oil weight of 40 oz. Notice the yield is now about 59 oz., which is still too much. When you resize the batch to include a 34 oz. oil weight, the yield is almost exactly 50 oz. Just right! 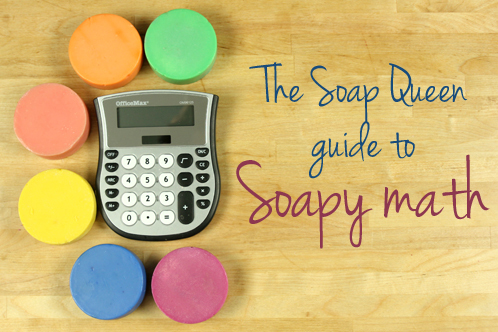 So there you have it — a mini refresher on soapy math. Do you have any mathy shortcuts or tips that make your soaping sessions easier? I’m new to making coffee scrubs and have been reading and reading on here about phenonip and I realize it is the preservative I need to use but I am so lost on how much I need to mix with Glycerol.. Can someone please help me out. I am am using 3 cups of coffee grounds, 1/2 cup coconut oil and then a teaspoon each of brown sugar and sea salt. No water. But I realize some water will get into it in the shower. I use many recipes. I store them all in the lye calc within the BrambleBerry iPhone app. I just finished making many homemade wood molds. I know how to calculate volume. Let’s say I am using It is 14.00 x 2.25 x 3.125 which is 98.4375 cubic inches when filled all the way to the top. Is there a formula used by soaping Pros, so that I can get a rough starting point for the batch size weight in ounces? When it comes to calculating how much a mold will hold, you can use water! Pop that mold on a scale, zero it out and pour water to the brim. That will give you a rough estimate of how much your mold will hard. Soap is more dense than water so it will be slightly different, but it’s a great place to start. Then, when you make your soap, make a little extra just in case. Weigh it once it’s in the mold to find out exactly how much it holds for your batch. Awesome post! Percentages and conversions can be so confusing, especially in the beginning. Thanks for all of the great tips! Extracts are not factored into the water or oils in a recipe. They are simply extract additives 🙂 If you are changing the recipe, the amount of extract you’d need to use would also change! Do you have a recipe in mind you’re working on? I’d love to help you out! 1 oz oil x 28.3 g/1oz x 1ml/0.89g x 1fl. oz/29.57ml = 1.08 fl oz. It’s a small difference, yes, but consider large batches of cp soap or the likes. Maybe just one of my residual irks from when I taught chemistry but I can remember woeful incidences from the lab about folks forgetting the proper conversion factors! I should have added that even with water, it’s not exactly 1 oz to 1 fl. oz-do the calculation and it’s slightly off! Great catch, and that’s a very good point! We only recommend converted ounces to milliliters when the measurements are very small. Some extracts have 1 – 3% usage rates, which results in teeny-tiny amounts. In that instance, it may be easier for some soapers who don’t have super precise scales to convert that amount to milliliters so they can use our handy droppers! OMG Anne-Marie – this is SO WONDERUL! Thanks!!! I am totally going to print this out and stash it in my file.